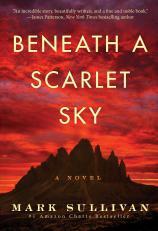 BENEATH A SCARLET SKY, Mark Sullivan’s highly anticipated new novel, is based on the true story of Pino Lella, who, during World War II, risked his life guiding Jews across the Alps into Switzerland, became a spy inside the German High Command, and fell in love with a woman who would haunt him for the rest of his life. In this interview, Sullivan talks about the emotional conversations he had with Pino, who ultimately was forced to choose between life and love; why historians have taken to calling Italy “The Forgotten Front”; the lessons that James Patterson (with whom he co-authors the Private series) has taught him about writing fiction; and how a chance encounter at a dinner party and his eventual friendship with Pino literally saved his life. Question: A self-described adventure nut, you’ve said you’re attracted to stories where characters are pushed to their limits, and Pino Lella, the hero of BENEATH A SCARLET SKY, is definitely one of these characters. He risked his life guiding Jews across the Alps into neutral Switzerland, then became a spy inside the German High Command. The unlikeliest of heroes, he witnessed unspeakable atrocities that pushed him to his limits. What made him able to do this? What set him apart from so many other people at that time? Mark Sullivan: I am interested in heroes who are pushed to their limits, forced to go beyond themselves, and Pino is certainly one of them. After spending 11 years with this story, I came to believe that Pino was able to survive all these incredible situations because of his basic decency, his gratitude and his love of life; because of his deep emotional intelligence; and due to his fundamental belief in the miracle of every moment, even the darkest ones, and in the promise of a better tomorrow, even when that promise was not warranted. That philosophy, or internal compass, if you will, enabled Pino to go beyond who he was, to turn selfless in moments of crisis. He conquered the dangers in the winter Alps by focusing on the people he was saving, their emotions and longings. As a spy I think he believed overwhelmingly in the value of his mission, and he felt compelled to bear witness to the atrocities committed by Nazis in Italy. Pino was also extraordinarily young, and like any brash young man he rarely seemed to let doubt cloud his thinking --- high in the Alps, or down in Milan in the presence of General Leyers. And, of course, Anna gave him strength. Q: When you first talked to Pino in real life, he was reluctant to tell his story, believing he was more a coward than a hero. Yet you convinced him to talk and ended up going to hear the story in Italy. Tell us about that. MS: The first time I called him from the states, he said he didn’t understand why I’d be interested in him. I told him that from what I knew of his story he was an uncommon hero. His voice changed, and he told me he was more a coward than a hero. That only intrigued me more, and after several more calls he agreed to my coming to Italy to hear the story in person and in full. When I first went to see him, I stayed for three weeks. He was 79, and living in a decaying old villa in the beautiful town of Lesa on Lake Maggiore north of Milan. I lived in an apartment on the third floor of the villa with a view of red tile roofs, the water, and the Alps beyond. Pino was raised fluent in Italian, French and English. He’d also lived in California for more than 30 years, so there was no need for an interpreter. We talked for hours in his drawing room, which was filled with old tapestries and paintings, a grand piano and the mementos of a long, fascinating life. Hours, days and then weeks went by as I listened to him summon up the past. But by the time I got to Pino, more than six decades had passed. Memories change and fade with time. And a tortured conscious mind will block out traumatic events, bury them in the subconscious, or shade them so the victim can look at them from a tremendous distance, and with little emotion. He was evasive at times. He had a self-deprecating nature and often downplayed his role and the dangers he faced. I often had to press him to just describe what happened versus filtering it through his meanings. Then the deeper story began to surface. We laughed. We cried. We became friends. It ended up being one of the most emotional and rewarding experiences of my life. Q: Throughout the war, while others watched and feared, Pino risked and acted without regard for his own life. Yet as selfless as he was, in the moment that mattered most, he put life before love. Tell us about that, and if he’s been able to move past it. MS: As I listened to the story, I, too, was struck at how intrepid and selfless he’d been. In the Alps, at 17, Pino guided Jews from the Catholic boy’s school in the dead of winter over the Alps into Switzerland, sometimes putting people on his back and skiing them to safety. Later, when he became the driver to a powerful Nazi general, and so a spy, he risked his life again and again to get information to the partisan resistance and to the Allies. Because he wore the German uniform, Pino was thought a traitor by many people who did not understand his role as a spy, including his own brother. He got through the isolation through his love affair with Anna, the maid of the mistress to the Nazi general Pino drove for. Anna is six years his senior, a woman with a mysterious past, but she becomes Pino’s confidante and his lover. Anna is his refuge, one of the few places he can turn to for sanity and hope for a future beyond the war. But, as you mentioned, there comes a moment late in the book, and in the war, when chaos and anarchy is reigning in Milan, and Pino is forced to choose between life and love. That scene is the emotional crucible of the novel, and one I had to pry out of him more than 60 years later. When he reluctantly and vaguely first described the scene to me, Pino showed distinct discomfort, and claimed he never saw the event personally, that he was told about it by the old concierge with the thick glasses, and that it took place somewhere in the streets of central Milan. He was rattled even by that admission, wept briefly, and then stared off for a long time. He asked if we could talk about other things. We did, but as that afternoon wore on into night, normally cheerful Pino became dark and agitated. He asked to rest until morning. Late that evening, from my apartment upstairs I heard him playing piano, a stormy and thunderous piece that I did not recognize. The next morning, he looked exhausted and said he had not slept well. The morning after that he looked ruined, and told me he’d suffered repeated nightmares of the event as an eyewitness. His descriptions of the nightmare version were incredibly detailed, and recounting it crushed him physically and mentally. Pino’s anguish was so raw and palpable, it rocked me to my core. I did the only thing I could, and went to hold the old man while he poured out his grief and torment. In the novel, the reader gets the dream version of Pino’s terrible dilemma because I believe the dream version is closer to the truth of what actually occurred to him during the sinister last days of the war in Italy, and I wanted the reader to travel the same gut-wrenching road. Did Pino move past that moment and the war? If you were to gauge that by the way he acted on a day-to-day basis during our reliving of his life at 17 and 18, and in the subsequent decade I spent on research, I’d say yes, absolutely. Pino was and is one of the most cheerful, considerate and giving people I’ve ever met. But the morning he described the nightmare to me was an entirely different story. He looked like he’d seen a ghost and been cast in a bitter trance. I will never forget his expression as long as I live. Q: You have a background as an investigative journalist for both newspaper and magazines. Why didn’t you tell this story as straight narrative nonfiction? MS: That was the original intent, but after years of trying to dig up the documented, fully corroborated story, I threw up my hands. So many other characters had died before I heard about Pino Lella, and the Nazis had burned so many documents surrounding his story that even after 10 years of research I had to make informed assumptions in the narrative. The obligations of the nonfiction writer and the novelists are different. The former must hew to the documented facts and eyewitness accounts. The latter should dig for a deeper, emotional truth. Q: The book is dedicated, in part, to “Robert Dehlendorf, who heard the tale first, and rescued me.” On the way to the dinner party where you learned about Pino Lella, you contemplated suicide and “prayed for a story, something greater than myself, a project I could get lost in.” You were saved by that story. What saved Pino? Tell us about your friendship and what Pino has meant to you. MS: January of 2006 was a terrible time for me. My brother had drunk himself to death the prior June. My mother had drunk herself into brain damage. I had written a book no one liked and was involved in a lingering business dispute. That day I realized darkly that my insurance policies were more valuable than my life and potential in the future. During a snowstorm, I seriously considered driving into a bridge abutment on an interstate freeway near my home, but I was saved by thoughts of my wife and sons. I was as shaken as I’ve ever been, and did indeed pray for a story. Believe it or not, that very night at a dinner party I was forced to attend by my sick wife in Bozeman, Montana, of all places, I heard the first snippets of Pino Lella’s tale. Larry Minkoff, a fellow writer, told me he’d heard a little about Pino, and his story, but wasn’t going to pursue it. Minkoff introduced me to Bob Dehlendorf. Dehlendorf had been successful on Wall Street before moving out west and buying the ranch where Robert Redford shot The Horse Whisperer. He also owned a small ski area in California and was fascinated by World War II. In the late 1990s, Dehlendorf was on an extended vacation in Italy when he met Pino by chance. Dehlendorf was a few years younger, but they bonded. After several days, Dehlendorf asked Pino about his experiences during the war. Pino had never told anyone, but felt like it was time, and started telling him about Father Re and the escapes, and the Nazi general he’d driven for. Dehlendorf was stunned. How had the story never been told? That was my reaction as well, and that was enough to get me on a plane to Italy. Over the course of those first three weeks, as Pino opened up more and more, I experienced his deep pain and marveled at his ability to go on after being so depressed and traumatized that he too had contemplated suicide. I had to comfort him repeatedly during the course of his long recounting, and I was moved again and again. During that time, and apart from the details of his war story, Pino taught me about life and his values and the many, many joys he’d been blessed with after handing over General Leyers to U.S. Paratroopers on the last day of the war. It made me realize how much I’d put in jeopardy even thinking about suicide. I had a great, loving wife and two remarkable sons. I had an amazing story to tell. I had a new and dear friend. I was more than lucky. Leaving Italy that first time, I felt blessed to be alive. I went home a different person, grateful for every moment, no matter how flawed, and determined to honor and tell Pino’s story to as many people as possible. I just never thought it would take that long. MS: It did take me an awful long time to dig up the details that surrounded Pino’s story. Remember I was trying to write this as nonfiction, and I wanted to nail the factual narrative. Over the years and between projects, I spent weeks in the Nazi War Archives in Berlin and Friedrichsburg, Germany, and in the U.S. Archives in Maryland. I went back to Italy twice more, and to Germany a second and third time. All along the way, I was hampered by the burning of Nazi documents in the last days of the war, especially by Organization Todt. The OT, as it was known, was like a combination of the U.S. Army Corps of Engineers and the Quartermasters Corps. The OT built fortifications across Italy and Europe. The OT manufactured or stole everything the German military needed, from cannons to uniforms, from ammunition to food. It did so on every front of the European theater by using slaves. Every time Hitler invaded a new country, he took every able-bodied male and called them “forced workers.” These slaves fortified the Russian Front. They built the western wall of pill boxes, tank traps and artillery emplacements that U.S. soldiers faced on D-Day. They built the Green and Gothic battle lines in Italy. They even built the concentration camps. The Germans were fanatical record keepers, but by the time Italy was freed there was very little left describing the OT and the million plus slaves believed to have toiled for the Nazis during the occupation. This was true everywhere I looked. It is estimated that as many as 11 million people were forced to work for the OT across Europe, and yet the documents still in existence about a vital part of Hitler’s war machine would fill less than three filing cabinets. As you mentioned, there was and is a collective amnesia concerning Italy and Italians in WWII. It’s due in part to the savagery that so many Italians like Pino Lella witnessed in the last days of the conflict. Northern Italy descended into anarchy, and public revenge killings were widespread. It was so bad that many brave partisan fighters shut their mouths and never spoke of what they saw as the Nazis fled toward the Austrian border. I also think historians have tended to ignore Italy because General Eisenhower decided to pull multiple divisions out of Italy in the late spring of 1944 to bolster the fight for France. After liberating Rome in June of that year, the progress of the weakened Allied forces remaining in Italy ground to a virtual halt. And the focus of journalists, historians and novelists turned largely to the drama of D-Day and its aftermath. Q: Despite some tolerated revenge killings in the immediate aftermath of the war, Italian authorities conducted relatively few trials of collaborators. General Leyers, who by his own admission sat at the left hand of the Fuhrer, and who was arguably the second-most powerful man in Italy during the last two years of World War II, was among those never prosecuted. Explain the “Missing Italian Nuremberg,” and how General Leyers literally got away with murder. MS: That story is another reason wartime Italy has not received its due attention. For almost two years after the end of the conflict, Allied prosecutors prepared cases against prominent Fascists and Nazis accused of war crimes in Italy. One of those Germans held awaiting trial was the man Pino drove for: Major General Hans Leyers, who ran the OT in Italy and answered directly to Adolf Hitler. By his title, he was a “plenipotentiary,” which meant he acted with the full authority of Reichsminister Albert Speer. In reality, he acted with the full authority of Hitler. What Hitler and his generals wanted, Leyers built, manufactured or stole. Like the master builders of Egypt’s Pharaohs, he did it with slaves. Pino drove for Leyers, and witnessed the vast armies of forced workers under the general’s total command. He saw men worked to death and brutally treated by Leyers’ men. But the general was never tried, and was released from a POW camp outside Innsbruck, Austria, 23 months after the war’s end. For years, I had no idea why. Then, in interviews I conducted in Germany in 2016, Leyers’ daughter, his former religious minister and his former aide told me that the general was released after testifying in secret against Albert Speer, Hitler’s architect, the head of the entire OT, and the only member of the Fuhrer’s inner circle to escape the hangman’s noose at the war crimes trials at Nuremberg. Speer was ultimately sentenced to 20 years in Spandau Prison for taking slaves. The minister and Leyers’ aide also claimed that Leyers had presented prosecutors with evidence that he’d helped Jews and Catholics who’d been in mortal danger in Italy under Nazi occupation. The truth is a little more complicated. By the spring of 1947, the world was growing weary of the war crimes trials and wanted to move on. Communism had gained a foothold in Italy, and the Allies began to fear that conducting open trials against Nazis and Fascists might turn the country more toward Russian influence. With little fanfare, the plans for an Italian Nuremberg were dropped. The trials never happened. The crimes and the charges were buried. Leyers and other men responsible for atrocities were set free, and subsequent generations of Italians were left with little shared memories of what exactly had happened in northern Italy during the war. MS: It’s not unusual. As I researched the book, I found that heroes and tragic victims of the Italian battlefront were commonplace, and often intentionally unheralded or unmourned. Pino and many, many others who survived the war in Italy blocked out their experiences. They, like Pino, witnessed men and women at their most noble and at their most savage. They, like Pino, rose to challenge after challenge, responded, and in victory and in tragedy promptly buried their memories and told no one. And it wasn’t just Italians. As I relate late in the book, the father of one of my close childhood friends was in the U.S. Army and fought in Italy. Peter never talked about the war and would deflect questions about his service. After he died, my friend was rummaging through his dad’s attic and found a box that contained a silver star for valor and a citation for Peter’s acts of selfless bravery at Monte Casino, one of the most brutal battles of World War II, on any front. Like Pino, he’d told no one. Q: In real life and in the book, Pino was surrounded by brave, talented people who accomplished great things during, and after, the war. Tell us about Pino’s family and friends who became national heroes, “Righteous Among Nations,” fashion designers, racecar drivers and even a saint. MS: Not quite a saint. Ildefonso Schuster, the Cardinal of Milan during and after the war, worked to save the city and the Jews under Nazi occupation. He knew about and encouraged the Catholic underground railroad that formed to get Jews out of Italy, many of them over the Alps in the winter of 1943-44. After Cardinal Schuster’s death, the future Pope John Paul II took up Schuster’s cause for sainthood and beatified him. Schuster’s blessed body lies in a crystal case beneath the Duomo cathedral in central Milan. Father Luigi Re ran Casa Alpina, the Catholic boys school high in Italy’s northern mountains where Jews and other refugees gathered before making the brutal climb to Switzerland. Father Re organized the escapes. Pino, his brother, Mimo, and other boys were the guides. For selflessly risking his own life again and again, Father Re was recognized by Yad Vashem, the Israeli World Holocaust remembrance center, as among the “Righteous Among Nations.” He is buried on the side of the mountain above the old school site. Father Giovanni Barbareschi, a confidante of Cardinal Schuster, and the forger for the underground railroad was also recognized as among the Righteous Among Nations for his role in helping Jews escape Italy. Barbareschi, Re, and other priests and nuns, along with ordinary Catholics, risked their own lives repeatedly to save others, which helps explain why 41,000 of the estimated 49,000 Jews living in Italy before the invasion managed to survive. Pino’s parents and extended family were in the fashion business in Milan. His mother and father designed and manufactured high-end purses. His aunt and uncle designed and manufactured fine leather goods sold all over the world. The Lellas and the Albanese family were also part of the resistance movement that sprang up soon after the Nazis invaded and set up Depose Fascist Dictator Benito Mussolini in a puppet government in September of 1943. The Lellas were active in promoting Milan as a global center of fashion until the day they died. Pino’s younger brother, Mimo, was cited for heroism after the war for standing down a company of Nazi soldiers and placing them under arrest at the age of 16. He went on to found Lella Sport, a company that manufactured ski- and athletic-wear. Pino’s cousin, Licia Albanese, fled to America before the invasion, and spent the rest of her long career as a soprano singing leads at the New York Metropolitan Opera under the direction of Arturo Toscanini. She died in 2014. Alberta Ascari, who taught Pino to drive, lived his childhood dreams and became an Italian national hero. Driving for Ferrari, Ascari was World Grand Prix Champion twice. He died during a practice run on the Monza track in 1954. Fifty thousand people showed up for his funeral at the Duomo. He is considered one of the greatest race car drivers of all time. U.S. Army Major Frank Knebel returned to California and became a newspaper publisher. When he died, he left behind cryptic notes about wanting to write an account of “great intrigue” that unfolded in Milan in the last days of the war. He never did. Carletto Beltramini became a salesman for Alfa Romeo, lived all over Europe, and was a close friend of Pino Lella until the day he died. Major General Hans Leyers moved to the small German town of Eischweiller upon being released from POW camp after the war crimes charges were dropped. Leyers had a great deal of wealth, but its source remains unclear. He and his wife had the money to restore a manor house on a large estate she inherited. He built a church and ran the estate until his death in 1983. As Leyers had predicted to Pino during the war, he had done well for himself before Hitler, during Hitler and after Hitler. Pino Lella is 91, and still lives on Lake Maggiore where he can see north to the Alps. MS: Mr. Patterson did give me a master class in commercial fiction. I’d written 10 novels before he asked me to collaborate with him, and I thought I knew what I was doing. For the most part I’d winged it in my earlier works of fiction, writing draft after draft before the real story appeared. Patterson believed in thinking out the plot up front. I struggled a bit, but soon came around to his way of thinking, which was essentially that novel writing was like house building. You have to be an architect first, and design the layout and frame before you start thinking about anything else. Patterson also taught me that we were entertainers, not educators, and that our stories were driven by suspense and mystery, but focused on emotion. He really hammered that into me, and I think my writing has improved vastly because of it. BENEATH A SCARLET SKY is an epic tale told on a sprawling canvas, but I tried to stay aware of the pace of the story at all times. I did it by remaining focused on the emotions that radiated off Pino when he first told me his story.